KiM Kosmos in Movement calls dancers, performers and physical actors for our advanced program of Visual Theatre-Dance in our Theater-Farm in Olmué, Region of Valparaiso, Chile. The KiM Post School is a 10-week program of permanent training, continuous exploration practical works in synthesis with experiential theory. This experience came to life with the spirit of creating an instance of refinement, experimentation and studies in Visual Theater- Dance departing from the new paradigms in which humankind lives in its evolution. We are living in a unique moment: all our understandings we were having until now regarding systems, hierarchies, the functioning of the things and beliefs have been transformed, have been “re-evolutionized”. 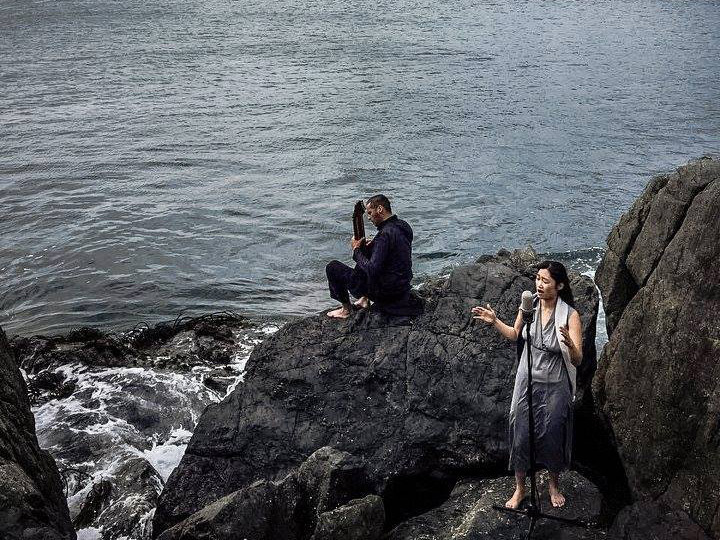 The path of KiM Physical Theatre is a Tao (Way) that invites us to participate in a embodied way to ask a series of questions that we are searching to respond through our very own practice and creative exploration regarding the times we live in. How do we embody the essence and the spirit of things? What is the Nature of our mind and physical bodies? How do we re-define the concept of culture and the scenic arts? From where do we create in these times? The “way of life” or Tao (Way) that includes nutrition (we are what we eat), meditation (passive and active styles) with the objective to sharpen our perception about ourselves and the reality that we are part of. This path is complemented by psycho-physical training always in evolution departing from integrated martial arts (Contact Dao), somatic practices, contemporary dance, experimental dance and interdisciplinary practices without any limits nor tied to a specific technique. Our program looks for deepening the experiential understanding of specific “principles” that challenge in a rigorous way organic movement of the body and the physical-vocal realm in the space and in the perception of the audience. Apart from our approach to diverse performative practices the KiM Post School also draws from comparative studies from various sources of knowledge (philosophy, cultural studies, transpersonal psychology, Traditional Chinese Medicine and Neurosciences). Much of our work is inspired being in open air, in nature with its infinite and untamed creativity, its sensation of extended time where our minds and bodies integrate, unify and unfold themselves in a natural and conscious way. We support the auto-sustainable cause with its socio- political implications as independent, self-determining beings living in harmony with its environment. The activities will take place in our theatre-farm in Olmuè (V.Region) as a work base, the National Park La Campana, the Pacific Ocean as natural laboratory and the Urban hills and labyrinths of Valparaíso as zones of performance en specific locations (site- specific). Our main objectives are investigation, creativity and action. Theory and Practice of Meditation: to acquaint oneself with the “observer/ witness” and the essence of emptiness of the Creator. – Neuro creActivity: The fundaments of creativity from neuroscience and its application to dance, movement and sound. – KiM Lab Training & Manipulations: Complete training and corporal manipulations. – Song, Rhythm and Body: Exploration of diverse conexions of movement, rhythmm, breath and voice through cross-cultural song. – Somatic Voice: investigating one’s possibilties of vocal expression as performative tool through somatic practices, vocal resonances, image, (e)motion departing from the body. mobility from new patterns of movement with the creation of visuality and poetic sense of image. nature (mountain and sea) and other urban spaces. – Introduction to Traditional Chinese Medicine and Nutrition. – Improvisation, Creation, Composition and tools for direction. (the mornings are free for rehearsals or other personal things). Se-Rok Park: Training and investigation of Voice-Movement, Meditation, Qi Gong, Macrobiotic Nutrition. José Chahin: Training (KiM Lab, Contact Dao and Qi Gong), Introduction to Traditional Chinese Medicine. Mariella Oteiza: Nutrition, Vegetarian and raw Vegan Kitchen. Joel Inzunza: Contemporary Dance, Release and Floor Work. Hernán Diaz: Neurosciences, music from the human brain and evolutionary history (new perspectives). This is a 10-week course with full commitment. The KiM Post School only accepts 12 participants. -Minimum of 3-4 years of active work and experience with one’s body and movement/ dance as departure of investigation and/ or creation. -Send us a motivation letter sharing your reasons why you want to study and train with us. and/or your creative and physical abilities. This fee includes the tuition, workspace, free pass for all the National Parks of Chile, Macrobiotic breakfast 3 days/ week (Mon, Tue and Thur) and Vegetarian lunch once/ week. Every participant should find its own accommodation close to our work space.